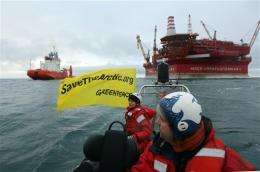 (AP)—Global warming has ignited a rush to exploit Arctic resources—and Greenpeace is determined to thwart that stampede. Employing the same daredevil tactics it has used against nuclear testing or commercial whaling, the environmental group is now dead-set on preventing oil companies from profiting from global warming by drilling for oil near the Arctic's shrinking ice cap. "It felt slightly surreal," recalled Ben Ayliffe, now the head of Greenpeace's campaign against oil drilling the Arctic. "After what happened in the Gulf of Mexico, how can anyone respond to that by going to drill in similar depths in a place called Iceberg Alley?" "Polar work feels like it's going back to the early campaigns: simple message, people get it and the lines are very clearly drawn," Ayliffe said. From a publicity standpoint, the campaign has been successful: Greenpeace officials say since June, 1.6 million people have signed the group's online petition urging world leaders to declare the Arctic a global sanctuary, off limits to oil exploration and industrial fishing. Dozens of celebrities, including Robert Redford, Paul McCartney and Penelope Cruz have announced their support, according to Greenpeace activist Sarah North. The impact on the oil industry, however, is unclear. The Arctic is believed to hold up to a quarter of the world's undiscovered oil and gas reserves. Despite difficult operating conditions and high costs, the payback for Shell, Gazprom, Statoil and other companies searching for commercial quantities of hydrocarbons could be huge. "It probably sounds a bit cynical, but if they invest billions of dollars it's not likely they will give it up just because somebody is attacking their oil rig," said Mikhail Babenko, an oil and gas expert at the World Wildlife Fund's Global Arctic Program. Unlike Greenpeace, WWF isn't seeking a complete ban on drilling in the Arctic but wants to make sure the most vulnerable areas are protected. "We want to be part of this discussion," Babenko said. "We don't want to stimulate oil and gas development, but if we follow (Greenpeace's) approach we will be simply out of the game." Cairn Energy, the Scottish company whose platforms off Greenland were targeted by Greenpeace protests in 2010 and 2011, isn't drilling there this year. By all accounts, that has nothing to do with Greenpeace but to the fact that the initial drilling was unsuccessful. Asked what, if any, impact the Greenpeace actions had on the company's future plans for Greenland, Cairn spokeswoman Linda Bain referred to its second-quarter report, which doesn't say anything about Greenpeace. Shell, which has also come into Greenpeace's cross-hairs for plans to drill off Alaska, also refused to discuss the group. Still, there's no doubt that Shell takes Greenpeace's Arctic campaign seriously. 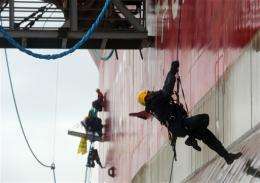 Greenpeace activists also climbed aboard icebreakers contracted by Shell as they left the Baltic Sea. And the Greenpeace ship "Esperanza" is now shadowing Shell's drilling vessels as they head north to bore exploratory wells in Alaska's Chukchi and Beaufort Seas. "We will follow the oil industry into the Arctic," Ayliffe said. "This is such an important campaign. We're not going to let them off the hook that easily." Founded in 1971, Greenpeace initially focused on nuclear testing. Its first Rainbow Warrior ship was sunk in New Zealand's Auckland harbor before it set out to protest French nuclear testing at Muroroa Atoll. Greenpeace photographer Fernando Pereira drowned. The Arctic campaign is part of the group's overarching focus on climate change. On Friday, six Greenpeace activists, including executive director Kumi Naidoo, spent several hours hanging off the side of the Prirazlomnaya platform in Russia's Pechora Sea, attached to the rig's mooring lines. Three days later, more than a dozen activists intercepted a ship carrying Russian oil workers to the platform and chained themselves to its anchor. While Greenpeace is sometimes accused of being "alarmist," environment and climate activists in general applaud the group for calling attention to global warming issues. Their activities don't always resonate well, however, with some of the indigenous communities in the Arctic. Ove Karl Berthelsen, Greenland's minister for oil and minerals, said he was skeptical of Greenpeace's claims to be acting in defense of indigenous communities. What a bunch of hypocrites. How much oil did they use flying and sailing to the Arctic to make their point? I guess (as with Al Gore) it's one rule for them, and another for the the rest of us. Gee, and I thought it was due to increasing demand for oil driving prices high enough that expensive Arctic drilling has now become more financially viable for the oil companies. Good for the Green Granola Crunchers! My hat is off to them. The faster they drive gas prices up, the sooner we will get over the peak oil and move on to a non-CO2 producing energy source.